For many years, I financially supported a charitable organization called "Puppies Behind Bars." Located in New York State, Puppies Behind Bars trains inmates to raise puppies to become service dogs for the disabled and explosive detection canines for law enforcement. The program works because raising puppies to become service dogs takes an enormous amount of time and effort, and if there's one thing inmates have, it's time. The brainchild of a woman named Gloria Gilbert Stoga, the program was originally designed to raise dogs that were to be trained as Guide Dogs for the Blind. Since its inception, it has expanded to include explosive ordinance disposal training and service dogs for all kinds of disabilities. Their most recent endeavor is called "Dog Tags," and involves providing service dogs to veterans returning home from Iraq and Afghanistan who have suffered a physical injury, traumatic brain injury or exhibit Post Traumatic Stress Disorder. A number of years ago, I stopped donating money to them, because their operating expenses were exceeding what I thought was reasonable. I have limited money to send to charities, and I can't abide the idea that it's being wasted. So I reluctantly took them off my list. I recently took another look at them, though, and I was DELIGHTED to learn their operating expenses had been reduced to about 15%, which is excellent. I'll be putting them back on my charitable giving schedule today. I love this program, and not just because it revolves around dogs, although that helps. I love the symmetry of it. Hardened criminals, some of whom have committed pretty heinous crimes. Disabled people, including disabled vets, who need help to regain some independence in their lives. 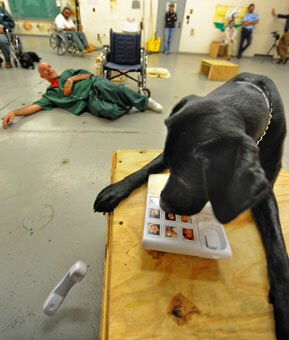 Law enforcement dog handlers, who need reliable and professional companions to help save lives. And the creature who brings them together - eight week old pups, who are destined to change every life they touch. The convicts testify to the healing power of their puppy raising experiences, how it changes their lives, softens their emotions, returns them to a state of community, of compassion, of love. The disabled people testify to the ways in which their companion dogs change every aspect of their lives, giving them independence, safety and companionship. And the law enforcement people talk about how PBB dogs are the best dogs - the best trained, the most ready, the most successful. These dogs - their very existence and interaction with humanity redeems us. Even the most hardened among us. Service dogs, in the truest sense. Redemption. Since I'm blessed to be hosting a dear puppy dog at my house this week, I have to agree whole-heartedly with the unconditional love that animals bring us. Glad to see such a deserving program!